Former New York Knick David Lee and Golden State Warrior teammate Kent Bazemore showed up at Holcombe Rucker Park and put on a show. Golden State Warriors David Lee and Kent Bazemore teamed up at Holcombe Rucker Park at 155th Street and Frederick Douglas Boulevard to play in the Entertainer's Basketball Classic. The NBA teammates delivered a show of high energy dunks, great passing, and showmanship as they suited up for Hillsong NYC at the perennial Harlem tournament. 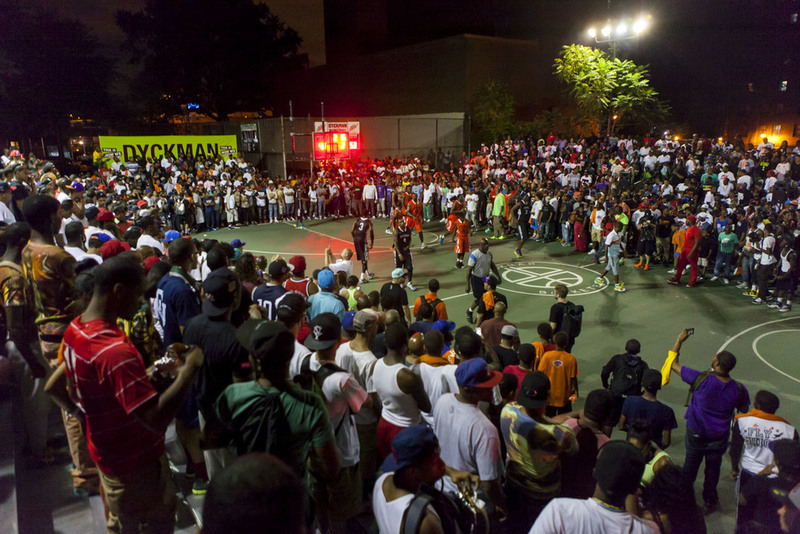 Dyckman Park was flooded with fans who simply could not miss the match up between Vampire Life and Skull Gang. Dyckman Park was in rare form even for the bar it has set for itself over the past few years. Thousands of fans filtered into the park to witness one of the most competitive games of the summer: Vampire Life vs Skull Gang. Jim Jones vs Juelz Santana. Jeremy "Cabbie" Hazell celebrates with Gary Erving (No. 3) during the Team Nike Tryout game that featured New York City's top streetball players. Team Nike's Tryout game was held at the world famous West 4th Street courts in lower Manhattan and featured 24 of the top streetball players in New York City. The game itself delivered on what you might expect from this elite group: A competitive game throughout that went right down to the final ticks of the clock. Rich "The Clumsy Janitor" Ross, of Harlem 4 Life, drives on "Super" Dave Seagers, who plays for the Body Snatchers, at Dyckman. Ah, That Summer Rain... Go Away! Harlem 4 Life and the Body Snatchers were in the middle of a fast-paced game where Rich "The Clumsy Janitor" Ross was going for 50 before the rain cut the game short and forced Dyckman to pack it up for the evening. Former George Mason standout, Ryan "Bird" Pearson is proving to be a handful for any defender in New York City this summer. The Sean Bell All-Stars are in the midst of an incredible run on the streetball scene, plausibly a historic dynasty in the making. They faced off with a talented and equally undefeated opponent in Skull Gang at Hoops in the Sun for an intense game that went down to the wire. Kemba "EZ-Pass" Walker laced up for his former coach, Maxwell "Bingo" Coles, at the Tri-State Classic as Bingo's All-Stars defeated Patterson Plus. Summer basketball in New York City is a one of one experience that every basketball fan should indulge in at least once and I dare say once you start, you will not be able to stop. Here are a few images I created at the Tri-State Classic on 145th Street and Lenox Avenue when Charlotte Bobcats point guard and Bronx native, Kemba "EZ-Pass" Walker laced up for the famed Bingo's All-Stars. Kemba "EZ-Pass" Walker of the NBA's Charlotte Bobcats has been making his rounds through NYC's major summer leagues including Brooklyn's East New York Classic. My first visit to Gersh Park for the East New York Memorial Classic opened my eyes to yet another of New York City's elite street basketball leagues. On this particular night team "King of Crossover" had an opportunity to measure up to the NBA talent level of Kemba "EZ-Pass" Walker and Lance "Born Ready" Stephenson, who suited up for "Sleep City." What ensued was streetball at its finest. 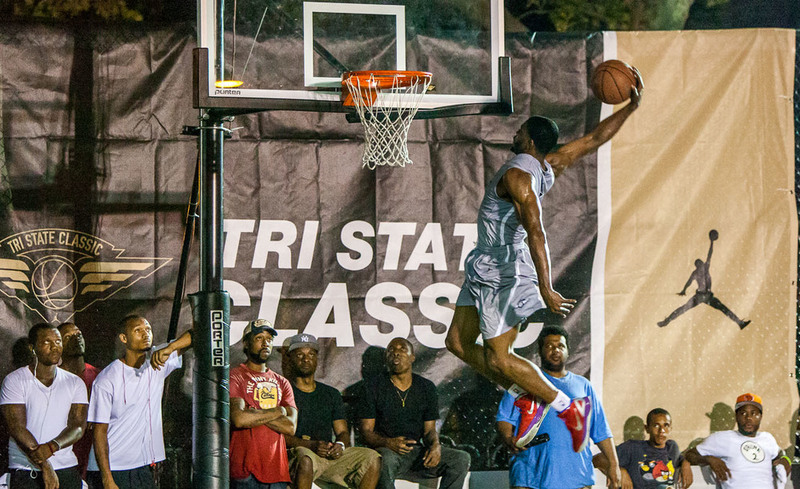 The Tri-State Classic basketball tournament, founded by the prolific former coach of the Bad Boys and Terror Squad teams that won a combined 6 championships at Rucker Park, Antonio "Mousey" Carela, is one of the best streetball venues in NYC. Street Basketball in New York City is Here! I'll be visiting all of NYC's major summer basketball tournaments this summer and sharing the images I create here on my blog. ​Find out what I'm looking forward to most in summer 2013 in New York City.